Greatest Funkin' Hits has something of a misleading title. 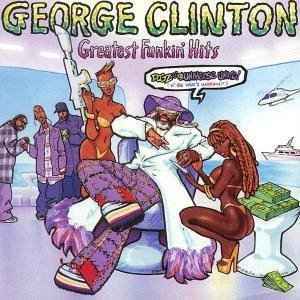 It implies that all of George Clinton's biggest solo hits, in their original forms, are featured on this compilation. Instead, Greatest Funkin' Hits takes Clinton's best-known songs -- not just solo hits like "Atomic Dog" and "Do Fries Go With That Shake," but also Parliament/Funkadelic songs like "Flashlight," "Mothership Connection," "Knee Deep" and "Bop Gun" -- and presents them in remixed forms. Sometimes, the remixes are good -- Coolio's take on "Atomic Dog" is fun, and Ice Cube's appearance on "Bop Gun (One Nation)" is terrific -- but often, the remixes are perfunctory and uninspired, making the album a tedious listening experience. Most importantly, it should not be considered in any way as a greatest-hits album -- it's simply another in a long line of pointless Clinton-associated remix albums. The title IS terribly misleading, and it is mostly a product of its time, but a few tracks of it are fine. If one looks at it as some of the beneficiaries of Clinton's creative genius giving a tiny crumb back in return (Probably only on Flashlight and Bop Gun, the latter of which could already be found on an Ice Cube album three years before), it's not anything great, but also not near as bad as others have said. In the case of the Jimmy G & The Tackheads track and the two from R&B Skeletons In The Closet album (which featured a just-dethroned Vanessa Williams pre-stardom), it pushed a couple very under-heard tracks into a dim spotlight of sorts. I paid $12 for it when it was first released, and it's not worth that. For a buck or two, it's fine. Rip-off release containing substandard, irrelevant, and cringingly dated remixes of Clinton's repertoire, and packaged in such a way that the label hopes you aren't tipped off until after you buy. Very little merit as an artistic effort, but valuable as a document of recording industry rapacity, and especially its methods for spinning out derivative content.